The Cove Cay Golf Course was designed by golf architect David Wallace and opened in 1972. It’s known for having spectacular views, an abundance of wildlife, and water that comes into play on 12 holes. With 4 sets of tees there’s yardage to suit any player. And, because it’s a USGA rated 18-hole championship length course, the layout is just as challenging for the golfer who has chosen to play 4,216 yards as it is for the golfer playing 6,079. Bill and Pat Shriver purchased the Cove Cay Golf Club in 2015 and have been working tirelessly ever since to get the course into the pristine condition it was known for in its early years. Their hard work has shown to have paid off with the comments and reviews being posted on Facebook GolfAdvisor and Google. 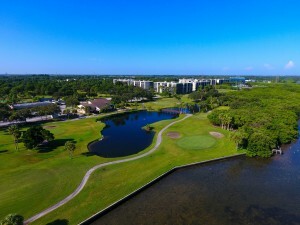 As Cove Cay is a semi-private facility that welcomes public play, the glowing feedback on the recent course and club repair has come from Cove Cay Condo and Tampa Bay residents, as well as tourists who travel for golf. Seeing is believing so if you haven’t played at Cove Cay in a while please schedule a tee time soon.